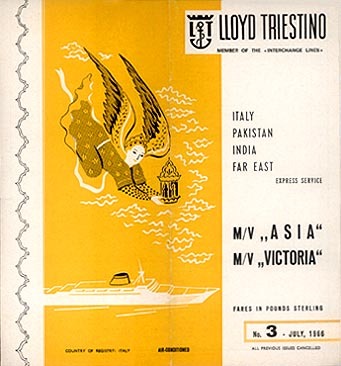 Also other services listed including postal services from Trieste to Egypt/Palestine/Syria, Greece/Smyrna/Constantinople and Candia/Piraeus/Salonica and express service Trieste to Bombay. No names of ships given. 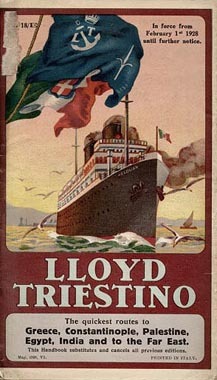 Trieste, Venice, Brindisi, Port Said, Suez, Massowah, Aden, Colombo, Penang, Singapore, Hong Kong, Shanghai, Kobe, Yokohama. Calling at Moji and Dairen on return, omitting Kobe. 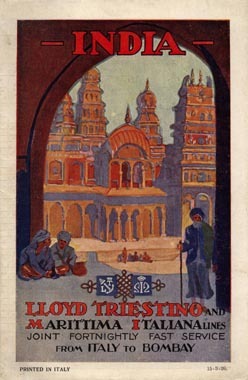 Optional call at Karachi outward and homeward. Giulio Cesare Genoa, Marseilles, Gibraltar, Dakar, Cape Town, Port Elizabeth, Durban. 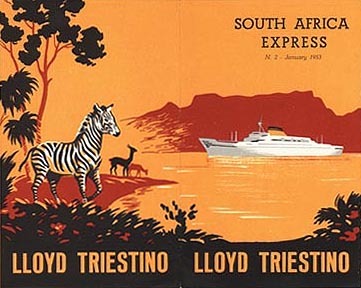 Return voyages: Durban, East London, Port Elizabeth, Cape Town, Dakar, Casablanca (only until Sep), Gibraltar, Marseilles, Genoa. 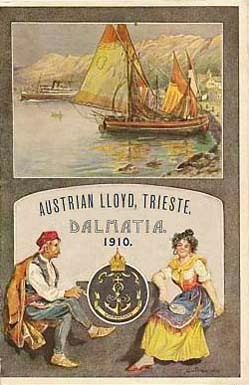 Trieste, Venice, Brindisi, Port Said, Suez, Aden, Mogadishu, Mombasa, Dar-es-Salaam, Beira, Durban, Cape Town. Also Port Elizabeth on return. 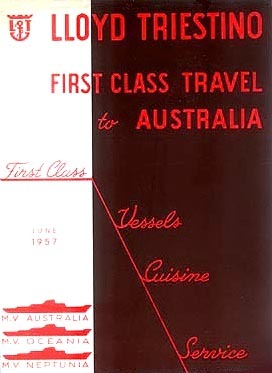 Genoa, Naples, Messina, Port Said, Suez, Aden, Colombo, Fremantle, Melbourne, Sydney. Also Djakarta on return. 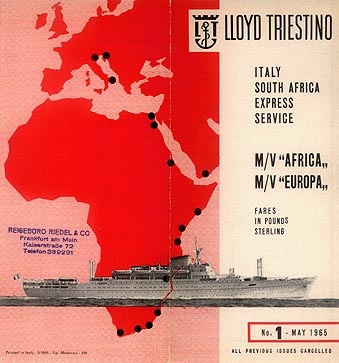 Rosandra Genoa, Marseilles, Sète, Algiers, Casablanca, Safi (optional), Dakar, Conakry, Monrovia, Sassandra, Abidjan, Takoradi, Accra, Lagos, Douala, Pointe Noire, Matadi. 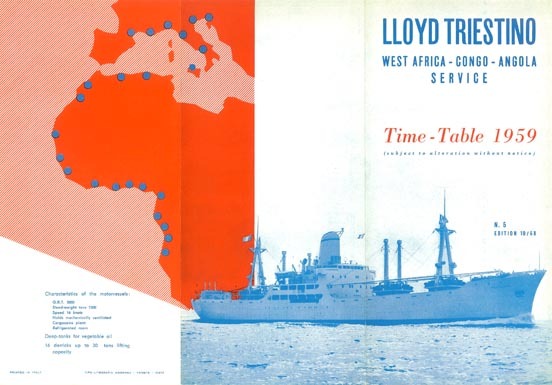 Return voyages: Matadi, Port Gentil (optional), Libreville (optional), Douala (optional), Lagos (optional), Takoradi, Abidjan, Sassandra, Dakar, Oran, Algiers, Marseilles, Genoa, Trieste, Venice, Palermo, Naples, Leghorn, Genoa. 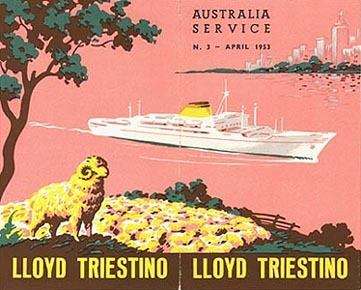 See the archives section for more brochures of Lloyd Triestino. This page last updated October 29, 2010.